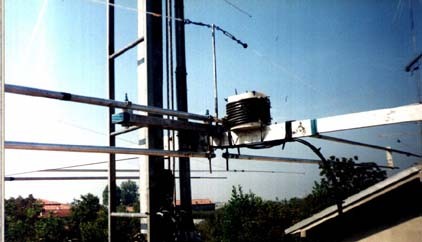 The antenna that I'm going to describe, is an elaboration of an antenna treated thirty years ago by I1VCF photographed by 'Handbook American and proposal to the readers of R.R. , Who originally worked on 10/15/20 meters. no traps, with one down power, lightweight and mechanically strong. 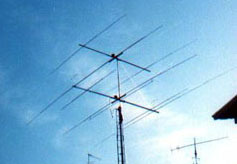 The antenna has a 4.60 m long boom and all elements are calculated exactly with the formulas that are on any text that speaks of a 3 element yagi antennas. attack radiators boom and their isolation (as being a dipole open center). that the only tools used are the usual drill and the ubiquitous hacksaw. Short, home-brew equipment, exactly. The boom: in my case, I found a rectangular piece diameter 45x3 mm. of tubular aluminum with a diam. 35x2, 5 mm. will form the total length of the boom. Suggest a solution with tubular framework dia. 40x40 mm plus diam. 45x45 mm., much easier to adapt to everything else that we will see. The two sections of the boom will go along with stops once it reaches the required length (hold 10 cm. more per part), with screws. stay jumpers needed (I used those for attacks TV antennas diam. internal 45 mm. x 5 mm.) that will unite the whole. scroll down to find the balance point, once made elements. Elements: all the elements will be of a diameter sufficient bear the weight at both ends of the winds, or snow, which meet. For these reasons, the central parts of all elements are Dia. outer 35 mm. reinforced with diam. approximately 40 mm internal x 50 cm., then climb up to a minimum diameter of 15 mm. and however make sure that the sections of the larger diameters remain inside diameter while the thinner outside, but with such lengths to form the minimum possible hanging. from the center of the element, will reach the most outdoor suited to be supported. The elements will be drilled in the center, at the point of reinforcement, to make stay jumpers (always those for TV diam. 45 mm internal x 5 mm.) attachment to the boom. Radiators: as to the radiators, you need a rectangular tubular diam. 50x35 mm. 1 m long, that will support the elements and insulators stay the same. The items will be drilled at two points per game to assemble the support, as well as insulators. It's actually more complicated to explain, than done. Radiators is advisable to stop at about mt 2.50 from the center, with a couple of blocks placed in vertical and drilled because of diam. that serve. These insulators have the function to make the structure radiators homogeneous and compact, secure with self tapping screws appropriate. We recommend the use of a central rod, as seen previously. point, fix the bracket to the boom. Power: In the center, the point of power, put a baloon 1:1 of any invoice or size. Frequency: at least 100 kHz calibrate lower. For more construction details, write to ik4dcs@libero.it.